Are you a current or past resident of Howard County, Maryland? Have you ever wondered how Howard County’s current system of local government came into being? If so, my book Dividing Howard is for you. 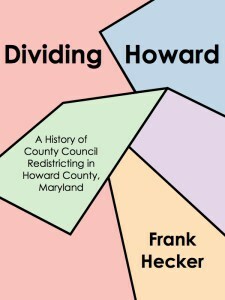 It tells the story of Howard County politics of the last fifty years, going all the way back to the creation of the planned community of Columbia, viewed through the prism of the establishment of the Howard County Council and the subsequent creation and redrawing of County Council districts. It’s an entertaining and even exciting story that includes heated disputes between the Democratic and Republican parties, internal fights between factions within the Democratic party, epic battles for political power between Columbia and the rest of the county, both failed and successful petition drives and referendums, multiple court cases (including one featuring a former U.S. attorney general), and provocative quotes from Howard County politicians past and present. It’s a must for anyone interested in Howard County politics or Maryland politics in general. Dividing Howard is available as an ebook for the Kindle from Amazon.com and for the Nook from Barnes and Noble, for $0.99. All royalties from the book go to Voices for Children, the Court Appointed Special Advocate (CASA) program in Howard County. Voices for Children recruits and trains volunteer advocates to represent the best interests of abused and neglected children in the Howard County Courts. If you don’t have a Kindle or Nook device you can read Dividing Howard using the Kindle or Nook applications for iPhone, iPad, and Android phones and tablets, available at no charge from the application stores for those devices. Don’t have a smartphone or tablet? You can use the Kindle or Nook applications for PC or Mac instead; just google “Kindle PC,” “Nook Mac,” and so on to find the application of your choice.